Vice President of Development Nick Herring says Shadetree tenants will be moving into the first completed building in early February. The other 12 buildings will be opened as completed, with the last of the 260 units to be available by June. We hear a lot about the need for reasonably priced housing in this area. That’s why Framework Group expects its new Shadetree Apartments to be positively received by South Hillsborough County residents seeking alternatives to single-family houses and condos. Framework calls the 30-acre complex the area’s first significant market-rate apartment development seen by the submarket in decades. Located on Cypress Village Boulevard near 19th Avenue N.E. 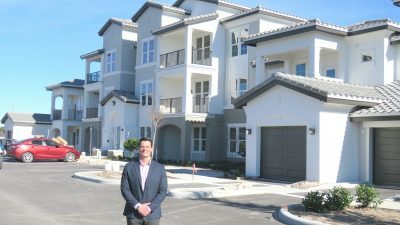 in Ruskin, the collection of 13 three-story buildings with 260 total apartments and a clubhouse is described as “simple luxury in harmony with lush natural surroundings.” The studios and one- to three-bedroom units — some with attached garages — range from 800 to 1,527 square feet. The monthly rates range from $1,200 to $1,600, with premium units topping out around $2,000. The apartments are designed for today’s lifestyles of all ages with big walk-in closets, great storage, quartz countertops and stainless-steel appliances. The clubhouse will include amenities such as a swimming pool, fitness center, sauna and conference rooms. President Phillip Smith is based in Tampa and leads Framework’s projects throughout Florida. He is responsible for the acquisition, design, development and construction of multi-family communities. The Ruskin property appeared on Smith’s radar 12 years ago because of its location — 30 minutes or less to major employment centers in Brandon/Riverview, Lakewood Ranch, Bradenton and Tampa — but negotiations paused due to less-than-optimum market conditions. The explosive growth of the South Shore area, as well as Amazon’s announcement of a Ruskin distribution center were major factors in his decision to proceed with buying the land and starting construction in 2017. Vice President of Development Nick Herring, also based in Tampa, said the finishing touches are underway on the first building to be occupied in February, and they will complete the clubhouse in March. The remaining buildings will be opened as completed, with the last one scheduled for June. He said they are looking forward to inviting the public in for a grand opening sometime before fall. “Shadetree is in a really high-quality neighborhood, and we want to be good neighbors,” said Herring. Early on, locals had some questions about the U.S. Housing & Urban Development (HUD) being involved, and they met with the neighboring homeowners associations prior to construction. In those meetings they explained that Shadetree is not rent-controlled and there are no income restrictions; the only relationship is that HUD insures Framework’s construction loan that is provided by a private lender. “Demand for rentals in this area has been growing over the past decade, but supply has not caught up with it. We expect interest among young people and empty nesters and have had a lot of web traffic and phone calls,” said Herring. Leasing efforts have been low-key to date through Shadetree’s website (www.shadetree.apartments) and by phone at 813-610-0079. A marketing presence will be established on-site after the clubhouse becomes functional in the next couple of months.